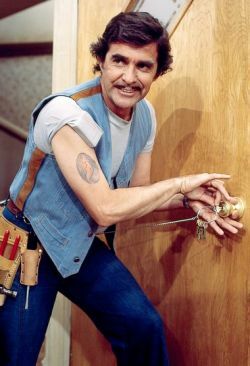 Actor Pat Harrington Jr., who was best known for his role as building superintendent Dwayne Schneider in One Day at a Time, has died. He died on January 6 in Los Angeles, California. He had Alzheimer's disease and fell in early November 2015. He suffered a small brain hemorrhage and spent three weeks in a hospital and nursing home. Mr. Harrington was 86. Survivors include his second wife, Sally Cleaver; two sons, Patrick and Michael, and two daughters, Terry and Tresa, all from his first marriage to Marjorie Ann Gortner; and four grandchildren. Schneider was a very funny and memorable character. Mr. Harrington played him to perfection. We thank him for the many laughs and entertainment he brought us over his long career. He will be deeply missed. Share your memories on our One Day at a Time message board. View photos in our galleries. 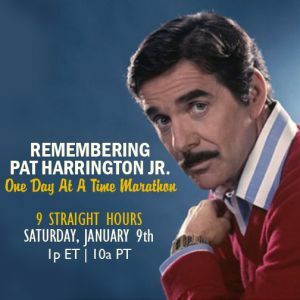 Antenna TV will commemorate the life of Pat Harrington Jr. with a One Day at a Time marathon airing tomorrow (Saturday, January 9) from 1pm-10pm ET. Antenna TV, which this year expanded to clearances on 125 stations across the country (including 49 of the top 50 markets) reaching 88% of TV households, will air a marathon of Schneider-centric episodes of One Day at a Time for this tribute. 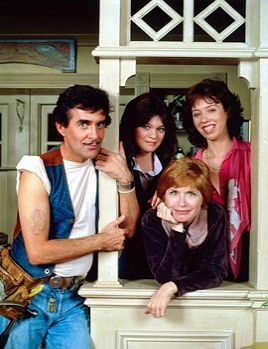 One Day at a Time regularly airs on Antenna TV at 4pm and 4:30pm ET weekdays and 7pm and 7:30pm Saturdays. For the week of Jan. 11-15, 2016, we have many current sitcom stars and past sitcom stars on TV talk shows! All times listed are Eastern. So get your DVRs (or whatever you use) ready! Ready? Here is all what you need to know for the coming week! Sherri Shepherd (Less Than Perfect/Sherri) - Catch Sherri on Watch What Happens: Live at 11pm on Bravo. Ken Jeong (Dr. Ken/Community) - Watch Ken on The Tonight Show Starring Jimmy Fallon at 11:34pm on NBC. Jane Lynch (Angel from Hell) - Jane appears on The Late Show with Stephen Colbert at 11:35pm on CBS. David Cross (Arrested Development/Running Wilde) - David is a guest on Late Night with Seth Meyers at 12:36am on NBC. Zooey Deschanel (New Girl) - Zooey visits The Late Late Show with James Corden at 12:37am on CBS. Jack McBrayer (30 Rock) - Jack stops by Conan at 11pm on TBS. John Krasinski (The Office) - John previews the film 13 Hours: The Secret Soldiers of Benghazi on LIVE! with Kelly and Michael, so check your listings. Heather Graham (Emily's Reasons Why Not/Scrubs) - Heather chats about the animated film Norm of the North on LIVE! with Kelly and Michael, so check your listings. Eva Longoria (Telenovela) - Eva joins the Chew Crew on ABC's The Chew at 1pm ET/12pm PT/CT. She also talks about Telenovela on The Meredith Vieira Show (check your local listings), on People Now and on Good Day New York on WNYW-Fox5 in New York sometime between 7-10am. Mo Collins (F is for Family/Parks and Recreation) - Mo appears on Home & Family on Hallmark Channel at 10am ET/PT. Hilary Duff (Younger/Lizzie McGuire) - Hilary can be heard on The Morning Mash Up on SiriusXM Hits 1 at 10am. Sutton Foster (Younger - Sutton talks about Younger on NBC's Today in the 10am hour. The Cast of Teachers - The cast of TV Land's Teachers are guests on NBC's Today in the 10am hour. Charlie Sheen (Anger Management/Two and a Half Men) - In a daytime television event, Dr. Oz visits Charlie in his Los Angeles home to find out how he’s really doing since revealing to the world he is HIV positive. Nothing is off limits in this raw, real and emotional conversation. It’s the interview you’ll be talking about. Check your local listings. Marilu Henner (Taxi/Evening Shade) - Marilu's super memory is put to the test on Fox and Friends on Fox News Channel sometime between 6-9am. She dishes on her Food Network special Marilu's Simple Good Food on HuffPost Live at 4pm. Kevin Hart (The Big House/Undeclared) - Catch Kevin on The Tonight Show Starring Jimmy Fallon at 11:34pm on NBC. He will also be on The Ellen DeGeneres Show, so check your local listings. David Duchovny (Californication) - David and Gillian Anderson are guests on Jimmy Kimmel Live! at 11:35pm on ABC. Eva Longoria (Telenovela) - Eva visits Late Night with Seth Meyers at 12:36am on NBC. She will also be on The Wendy Williams Show at 12am on BET or on your local stations. Betty White (Hot in Cleveland/The Golden Girls/The Mary Tyler Moore Show) - Betty appears on The Late Late Show with James Corden at 12:37am on CBS. Steve Carell (The Office) - Steve drops by Conan at 11pm on TBS. Kirstie Alley (Kirstie/Veronica's Closet/Cheers) - Kirstie talks about her new Netflix series Flaked on The Meredith Vieira Show, so check your local listings. Deon Cole (black-ish) - Deon appears on The Real, so check your local listings. Jodie Sweetin (Fuller House/Full House) - Jodie guest co-hosts The Real, so check your local listings. Sutton Foster (Younger) - Sutton joins the Chew Crew on ABC's The Chew at 1pm ET/12pm PT/CT. Jane Lynch (Angel from Hell) - Jane will be on CBS This Morning sometime between 7-9am. Heather Graham (Emily's Reasons Why Not/Scrubs) - Heather discusses her new animated film Norm of the North on NBC's Today in the 10am hour, on the AOL Build Show at 3pm and on HuffPost Live at 3:30pm. Hilary Duff (Younger/Lizzie McGuire) - Hilary talks about Younger on NBC's Today in the 9am hour. Ken Jeong (Dr. Ken/Community) - Ken talks about Ride Along 2 on NBC's Today in the 10am hour. Bob Saget (How I Met Your Mother/Surviving Suburbia/Full House) - Bob talks about guest starring on Grandfathered on Access Hollywood Live, so check your local listings. George Lopez (George Lopez) - George talks about the World Dog Awards on Access Hollywood Live, so check your local listings. Charlie Sheen (Anger Management/Two and a Half Men) - Part 2 - In a daytime television event, Dr. Oz visits Charlie in his Los Angeles home to find out how he’s really doing since revealing to the world he is HIV positive. Nothing is off limits in this raw, real and emotional conversation. It’s the interview you’ll be talking about. Check your local listings. Danny DeVito (It's Always Sunny in Philadelphia/Taxi) - Watch Danny on The Tonight Show Starring Jimmy Fallon at 11:34pm on NBC. Heather Graham (Emily's Reasons Why Not/Scrubs) - Heather is a guest on Late Night with Seth Meyers at 12:36am on NBC. Tim Robbins (The Brink) - Tim drops by The Late Late Show with James Corden at 12:37am on CBS. Adam Devine (Modern Family/Workaholics) - Adam is a guest on The Late Late Show with James Corden at 12:37am on CBS. Eva Longoria (Telenovela) - Eva visits Watch What Happens: Live at 11pm on Bravo. Patton Oswalt (The Goldbergs/The King of Queens) - Patton appears on Conan at 11pm on TBS. Brie Larson (United States of Tara/Raising Dad) - Brie discusses her film Room on LIVE! with Kelly and Michael, so check your listings. Miriam Shor (Younger/Inside Schwartz) - Miriam discusses Younger on The Meredith Vieira Show, so check your local listings. Miriam and Sutton Foster will also be on New York Live on WNBC in New York at 12:30pm ET. Jane Lynch (Angel from Hell) - Jane joins the Chew Crew on ABC's The Chew at 1pm ET/12pm PT/CT. She also discusses Angel from Hell on the AOL Build Show at 2pm. The Cast of Younger - Sutton Foster, Nico Tortorella, Miriam Shor, Debi Mazar, Hilary Duff, Peter Hermann, Molly Bernard, Dan Amboyer and Darren Star discuss Season 2 of the TV Land series Younger on the AOL Build Show at 4pm. Saffron Burrows (Mozart in the Jungle) - Saffron is a guest on People Now. Kevin Hart (The Big House/Undeclared) - Kevin talks about Ride Along 2 on NBC's Today sometime between 7-9am and in the 9am hour. Brooke Shields (Suddenly Susan) - Brooke talks about Flower Shop Mysteries on NBC's Today in the 9am hour. Allison Janney (Mom/Mr. Sunshine) - Allison is a guest on The Ellen DeGeneres Show, so check your local listings. Tiffani Theissen (Saved by the Bell/Saved by the Bell: The College Years) - Tiffani discusses the second season of the Cooking Channel's Dinner at Tiffani's on HuffPost Live at 3pm. Ariana Grande (Sam & Cat) - Catch Ariana on Jimmy Kimmel Live! at 11:35pm on ABC. T.J. Miller (Silicon Valley/The Goodwin Games/Carpoolers) - T.J. drops by The Late Show with Stephen Colbert at 11:35pm on CBS. Rashida Jones (Parks and Recreation/The Office) - Rashida appears on Late Night with Seth Meyers at 12:36am on NBC. Kevin Hart (The Big House/Undeclared) - Kevin visits Conan at 11pm on TBS. The cast of Ride Along 2 will be on NBC's Today in the 9am hour. Nick Robinson (Melissa & Joey) - Nick appears on Conan at 11pm on TBS. Heather Graham (Emily's Reasons Why Not/Scrubs) - Heather stops by Watch What Happens: Live at 11pm on Bravo. Brooke Shields (Suddenly Susan) - Brooke is a guest on Watch What Happens: Live at 11pm on Bravo. She also joins the Chew Crew on ABC's The Chew at 1pm ET/12pm PT/CT. Aubrey Plaza (Parks and Recreation) - Aubrey appears on LIVE! with Kelly and Michael, so check your listings. Brandy Norwood (Zoe Ever After/The Game/Moesha) - Brandy guest co-hosts The Real, so check your local listings. Malin Akerman (Sin City Saints/Trophy Wife) - Malin talks about Billions on Access Hollywood Live, so check your local listings. Mike Epps (Survivor's Remorse) - Mike is a guest on New York Live on WNBC in New York at 12:30pm ET. Wendell Pierce (The Odd Couple/The Michael J. Fox Show) - Wendell appears on Tavis Smiley on PBS, so check your local listings. Kathy Griffin (Suddenly Susan) - Watch Kathy on a repeat of Jimmy Kimmel Live! at 11:35pm on ABC. Ray Romano (Everybody Loves Raymond) - Ray stops by The Tonight Show Starring Jimmy Fallon at 11:34pm on NBC. Maria Bamford (Benched/Arrested Development) - Maria appears on The Late Show with Stephen Colbert at 11:35pm on CBS. Christian Slater (Breaking In) - Christian is a guest on a repeat of Late Night with Seth Meyers at 12:36am on NBC. Retta (Parks and Recreation) - Retta appears on a repeat of Late Night with Seth Meyers at 12:36am on NBC. Amy Landecker (Transparent) - Amy is a guest on repeats of The Late Late Show with James Corden at 12:37am on CBS. and Last Call with Carson Daly at 1:35am on NBC. John Krasinski (The Office) - John visits LIVE! with Kelly and Michael, so check your listings. Ken Jeong (Dr. Ken/Community) - Ken is a guest on LIVE! with Kelly and Michael, so check your listings. Sarah Michelle Gellar (The Crazy Ones) - Sarah appears on The Meredith Vieira Show, so check your local listings. Atticus Schaffer (The Middle) - Atticus stops by The Real, so check your local listings. Vivica A. Fox (Mann & Wife/True Jackson, VP/Out All Night) - Vivica guest co-hosts The Real, so check your local listings. Valerie Bertinelli (Hot in Cleveland/One Day at a Time) - Valerie is a guest on People Now. Heather Graham (Emily's Reasons Why Not/Scrubs) - Heather talks about her role in the new animated film Norm of the North on Rachael Ray, so check your local listings. Rashida Jones (Parks and Recreation/The Office) - Rashida discusses her new comedy Angie Tribeca on NBC's Today in the 9am hour, on The View on ABC at 11am ET/10am CT-PT and on the AOL Build Show at 3pm. Sherri Shepherd (Less Than Perfect/Sherri) - Sherri talks about Ride Along 2 on New York Live on WNBC in New York at 12:30pm ET. Jay Mohr (Gary Unmarried/Action) - Jay discusses his Grammy nomination for Best Comedy Album for Happy, And A Lot on HuffPost Live at 1pm.